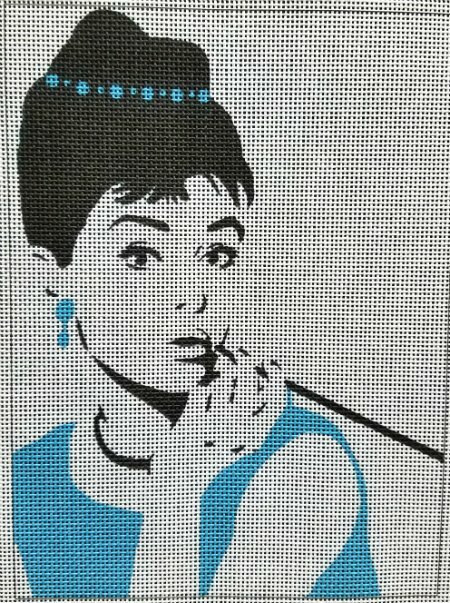 An Audrey Hepburn Breakfast at Tiffany's needlepoint canvas that is an easy to stitch needlework project. Measures 7.5" x 10" on 13 mesh. If you need threads then we have a price on the drop down menu of your options. Cotton is DMC floss; Wool and Silks are both Planet Earth boutique fibers which are single ply for 13 mesh and easy to stitch with. If you want to keep this canvas taut while you stitch it then we recommend mounting it onto a pair of 14" and a pair of 11" stretcher bars with some thumb tacks. The stitched Breakfast at Tiffany's needlepoint canvas can be framed or made into a pillow. Contact us with any questions. We love to help.